Canadian University Australian Football Championships. The Edmonton Australian Football Club in conjunction with AFL Canada is introducing Australian Football into the Canadian University Championships. 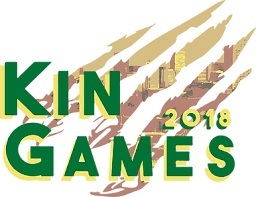 These games actually go under the banner of KIN, or Kinesiology Interscholastic Conference Games and are held annually across Canada.. Currently there are two university football clubs in Canada, Concordia and the University Of Calgary. They will be the backbone in introducing football to the other groups. There will be 500 kinesiology university students playing footy according to AFL Canada president Lachlan http://Griffiths.It will be an indoor co-ed touch version of footy. It is hoped that this taste of footbaoll will encourage players to return more serious at the next KIN scheduled for next fall. Journalist Tom Zillich from the Surrey Now – Leader newspaper in Vancouver, British Columbia has written a wonderful little story about the work of Mike McFarlane and his great team at the North Delta juniors in Canada. His achievements to grow junior footy in a part of the world where the game is a long way from the most popular is nothing short of amazing. Mike McFarlane would love to play the game known as “footy,” but he says he’s “way too old. 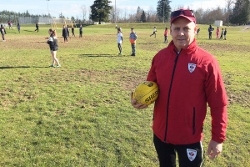 “Head tells me I can, body says no,” says the man who helps run the North Delta Junior Australian Football League, or NDJAFL. Instead, McFarlane is keen to get kids sign up to play the game, which has been played in Canada since 1989 and in B.C. since 2001. The NDJAFL was formed in 2003 and has since grown from 28 young players to approximately 140. Canadian National Football Championships are coming to Toronto aptly on Canada Day in a further attempt to improve the representative performance of Canadian teams. 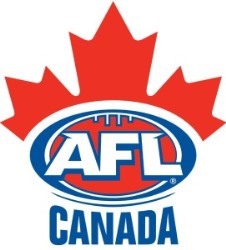 At the recent AFL Canada AGM it was noted that two new positions were added to the AFL Canada board specifically targeting men and women’s national player representation. Canadian men’s football international performances can be viewed as either competitive against it’s bigger southern neighbor or as not having leveraged the most out of it’s competitive Toronto league, acknowledged as.the best outside of Australia. The full report can be read here http://websites.sportstg.com/assoc_page.cgi?client=1-7259-0-0-0&sID=154776&&news_task=DETAIL&articleID=61461986. 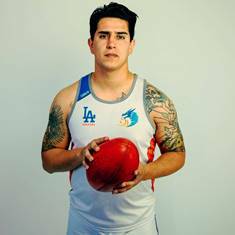 Two bright young talents from the USAFL’s Los Angeles Dragons are taking their talents across the Pacific: both Gabriel Martin del Campo and Sam Murphy will be competing in local Aussie rules leagues in the 2018 season. A member of the US Revolution squad, Martin del Campo (pictured left) primarily plays in the midfield or half-forward line and will be taking his talents to suburban Melbourne. Born and raised in Southern California, Martin del Campo leaves on January 19th and will play with the Black Rock Football Club, who compete in the Southern Football League’s Division 3. In addition to Aussie rules, Martin del Campo also played rugby union and soccer in his younger years. He is a physical and versatile player who excels on the disposals and clearances. In a big few weeks for the USAFL currently in the offseason, there has been change at the top and parting of ways between tje league and the Tampa Bay ARFC. Steve Grandfield who was elected USAFL President just this past October has resigned the position "due to professional opportunities outside of football". Following a highly successful National Championships in San Diego and riding a wave of optimism, the league is looking for some stability at the top after previous president Denis Ryan resigned for personal reasons and the position then being filled leading to this year's election by VP East, Mike Sheppard. Per the USAFL constitution, if the President role is vacated, the longest serving Vice President fills the role until the next AGM. Sebestian Aguiari who has been the Vice President of the West Region since 2015 with the agreement of the USAFL board will now serve as USAFL President until the next AGM in October. The USAFL also released the following statement on the group calling themselves Major League Footy based around the Tampa Bay ARFC/ St Petersburg Swans "We are aware of some social media activity regarding Major League Footy (MLF) recently and we want to make sure it is very clear that the USAFL is in no way affiliated with MLF or any of its operations. MLF is a For-Profit organization and its business model is in conflict with the USAFL's Non-Profit status. Subsequently, be advised that the Tampa Bay ARFC / St Petersburg Swans are no longer a USAFL member club." In the current Australian Rules football climate the idea of a national league team being located outside of Australia is still being viewed as untenable and unnecessary by many. So, imagine how far-fetched an idea it must have been to suggest the re-location of a VFL team to the United States back in the late 1980’s. To further highlight the extravagance of the idea, many international-based competitions were yet to be created and only a very embryonic network of Australian Rules football competitions existed outside of Australia. In fact, the Sydney Swan shad only just moved permanently to the harbour city in 1982 and the West Coast Eagles and Brisbane Bears were admitted to the VFL in 1987 – the competition was barely a national one much less ready to go overseas. Yet, the following excerpt from Michael Warner’s story in the Herald Sun newspaper sheds light on this idea – which almost ironically could be seen as a forerunner to expansion and development processes for the game in the decades following. 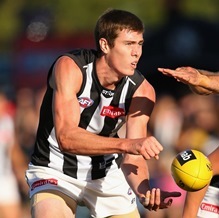 Mason Cox has managed to make a remarkable transition to Australian Rules football in his brief time in the AFL. In just 20 AFL games, the big Texan has grown more and more familiar with the game and begun to exert his influence on games, using his towering 212cm frame to disturb opposition defences. He has kicked 27 goals in his three seasons at Collingwood, with a strong prediction that there is better to come. The www.afl.com.au website has suggested as much with their latest article, exploring players likely to have breakout seasons in 2018. Here's your chance to win the perfect gift for the Bombers or Cats fan in your life, or yourself, while supporting footy in Portland (Oregon)! On December 16th, during our PAFC Holiday Party, we’ll be raffling off team-signed Essendon and Geelong jumpers, with the drawing streamed online on Facebook Live. Proceeds will support the Portland Australian Football Club as we head into the 2018 season. Both jumpers are signed by their respective full 2017 senior teams, including all-Australians Patrick Dangerfield and Joel Selwood for Geelong, and Joe Daniher, Michael Hurley, and Zach Merrett for Essendon. Each jumper will be raffled off separately; tickets can be purchased online using the forms below through noon PST on December 16th. Then, at 6:30pm PST on the 16th, head to our Facebook page to watch as the winners are drawn. To order your tickets head to the raffle page here. Winners located anywhere in the United States will be shipped their jumper via USPS 2-Day Priority Mail. Winners located in Australia will be charged $15 USD to cover international shipping. The Baltimore Washington Eagles have announced they will amicably split the club into two new entities. Following a very successful year on and off the field in the club located in two cities, it has been agreed that each location will now have their own team. 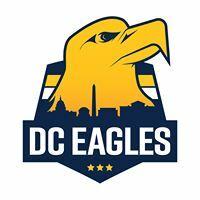 The new Washington based entity the DC Eagles will retain the club mascot and colours (and support of the AFL's West Coast Eagles) and continue to play in the nations capital. 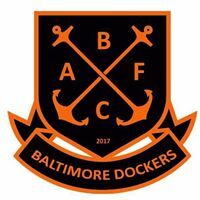 The Baltimore Dockers Australian Rules Football Club announced themselves on Facebook this week with a post stating "We are excited to announce the Baltimore Dockers Australian Rules Football Club! After growing the sport in the DMV area and playing as the Baltimore Washington Eagles Australian Rules Football Club for 20 years, we been able to establish independent football clubs in DC and in Baltimore. We're looking forward to your support and seeing what the 2018 season has in store!" 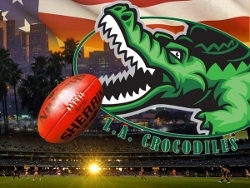 They hope to garner the support of AFL club Fremantle and emulate the Eagles/Dockers rivalry that thrives in the city of Perth, Australia.